The Future Changes its Spots! « Getting a Head Start on the “End of the World”! 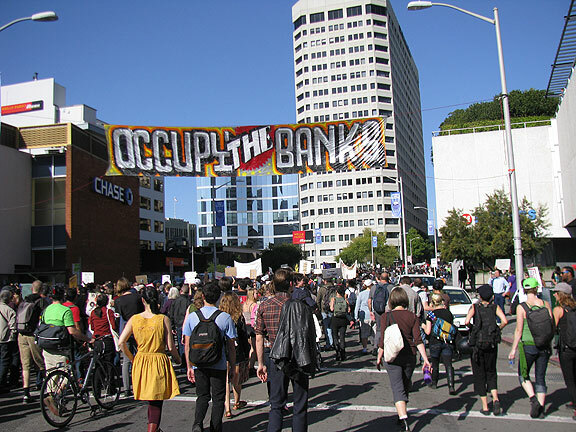 The Occupy movement is going through a pivotal moment right now, with various camps—notably Oakland, Portland, and New York City—being destroyed by police action during the past few days. The punditocracy and the politicians are all hoping this will bring it to an end, but that is not going to happen. It is likely that the focus on camping and holding public plazas may give way to new tactics, but the newly vocal populations all over the U.S. are not going to be silenced just as they’ve rediscovered their voices. 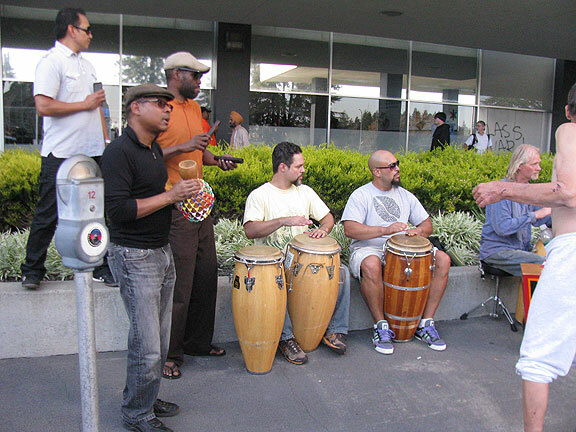 Arriving at 14th and Broadway in downtown Oakland on November 2, we were met with this amazing scene. Walking around the area, the scenes of everyone together were endlessly inspiring. An historic day! 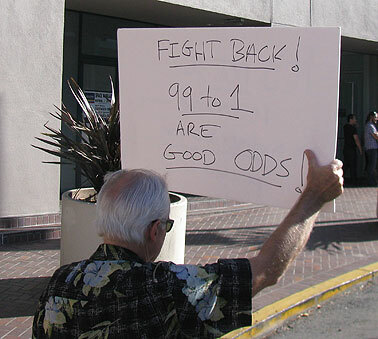 In particular, the Oakland General Strike of November 2 was an historic event. 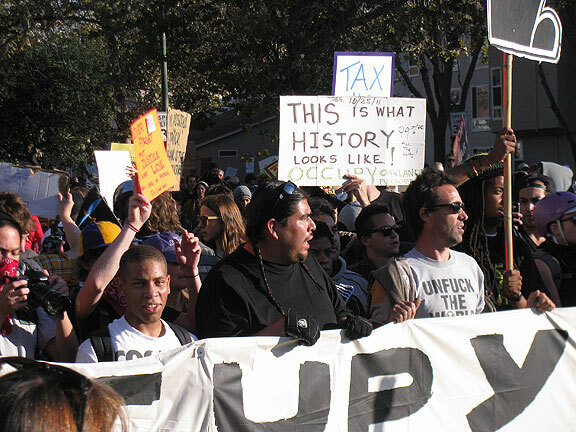 For the first time in the U.S. an urban General Strike emerged from the new working classes, the precarious, the unemployed, the unorganized, and the poor, brought together 2,000-strong in the Occupy Oakland General Assembly on October 26 and voting 96% in favor. One week later it happened, and it was an amazing day. General Strikes are not so rare in other parts of the world, of course. Several cities in Syria have been out for almost two weeks as I write. Italy and France have had many one-day general strikes in the past decades. But those have been led by giant trade union confederations, and kept under pretty tight control. 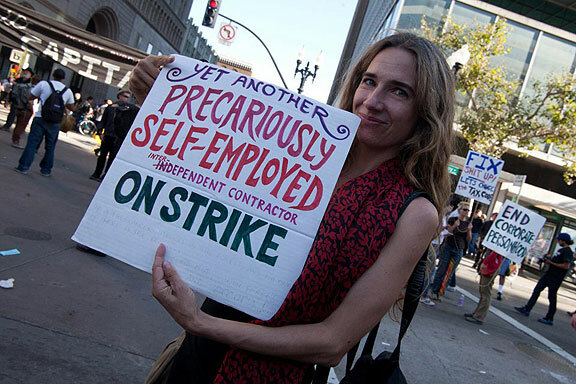 The Oakland General Strike was an opening salvo from an unexpected quarter: the “precariat” (a neologism made by combing precarious and proletariat). Local unions could not formally endorse the call in such a short time, and are often bound by no-strike clauses in their contracts. 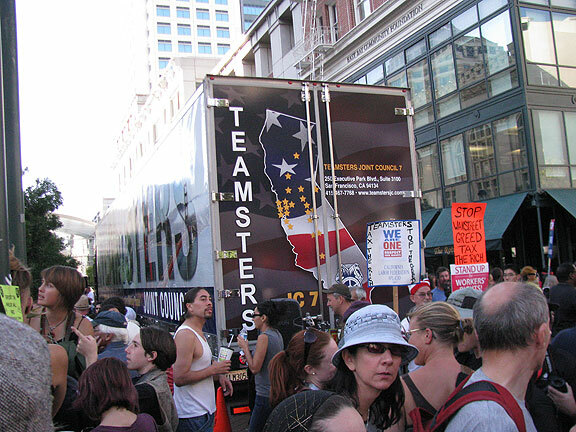 Nevertheless, rank-and-file members of the Service workers (SEIU 1021), the Teamsters, the Longshore and Warehouse Union (ILWU) and others, enthusiastically joined in during the day-long festival that gripped the center of Oakland, culminating in the mass marches towards dusk that shut down the Port of Oakland, the nation’s fifth largest. But organized labor was following, not leading this General Strike. The people filled the city center with music, banners, marches, humor, performance, food, yoga, meditation, childcare, art-making, and more. Rappers, hip-hop spoken word artists, and folk musicians all performed in the streets. Urban farmers showed up with free vegetables grown in the city’s reclaimed lots. Free valet bike parking was provided by local bicycle advocates. Dozens of economic and environmental justice activists were in the mix. 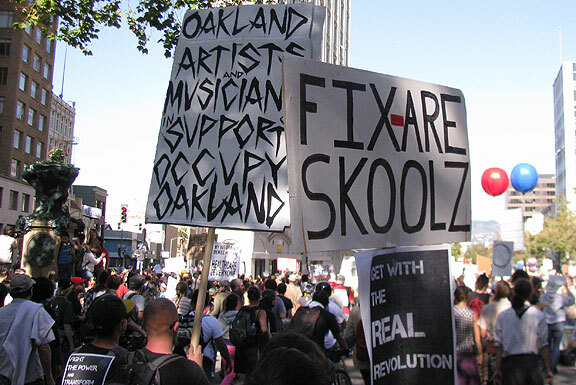 The Oakland General Strike not only halted business as usual in much of Oakland, but demonstrated practical everyday alternatives that are already well entrenched in the area. Much to my surprise, the Teamsters showed up with a truck load of hamburgers and hot dogs from the Alameda County Labor Council which they fed to all comers for hours. 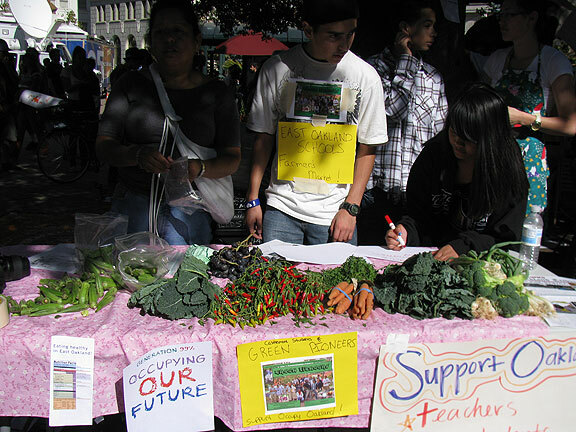 This table offered free veggies from the East Oakland schools farmers market. This booth had already given away all its food by the time I took this photo. 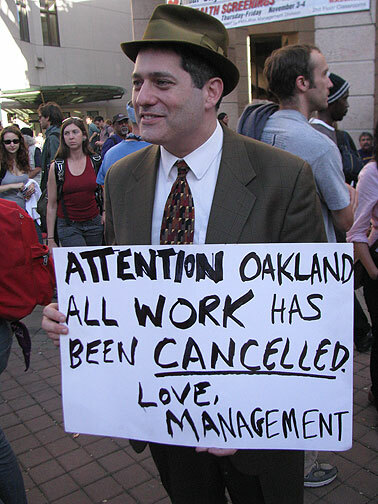 Most hopefully, the Oakland General Strike excited everyone who turned out, leading to cascading feelings of solidarity and possibility, which in turn flows out of Oakland and across the networks of occupiers everywhere. 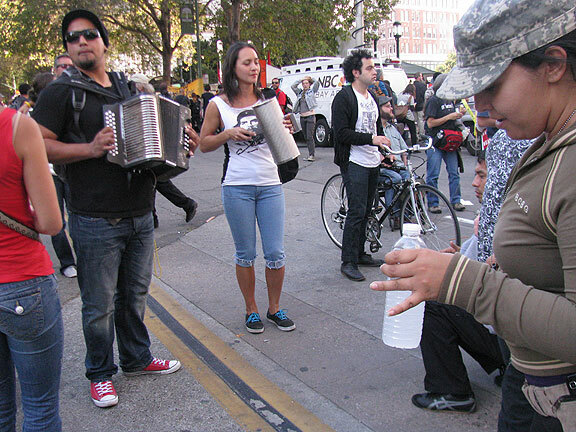 Solidarity messages flowed in from as far away as Egypt, while Oakland suddenly found itself in the eyes of the world. The one-day strike was a powerful demonstration to local and national elites, but more importantly, it was a powerful demonstration to participants and allies, shifting imaginations about what is possible. 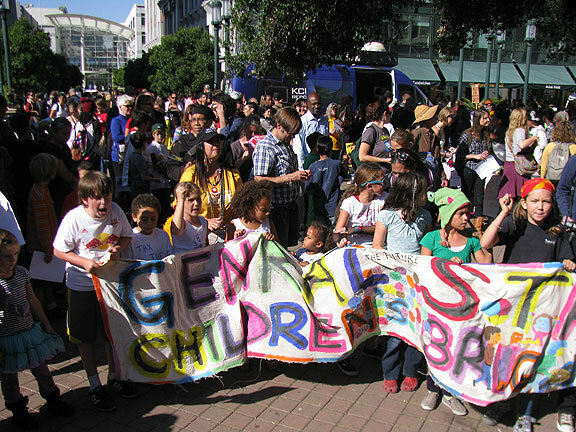 This boisterous Children's Brigade was amazing, hilarious, and wildly inspirational! 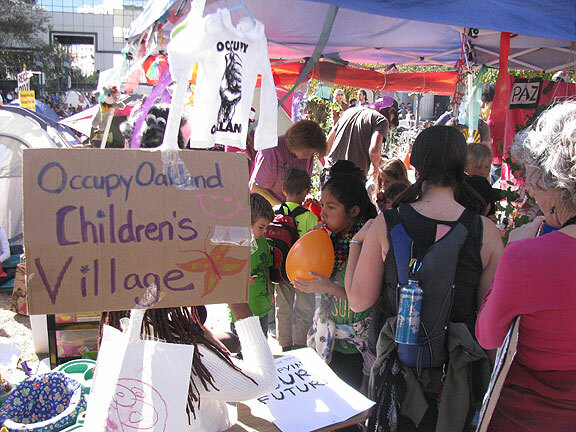 This Children's Village was an integral part of the Oakland Commune at the plaza in front of City Hall... hardly looks like a security or public health hazard does it? The medical tent at the Occupy Oakland camp, November 2, 2011. This IS what history looks like! Mona and her great sign. Music and dance erupted all over the area. Habana Matanza played right along the route of the big anti-capitalism march during the afternoon. The attempt to seize an empty, nearby building late that night, leading to a skirmish with police and some minor property damage in the area, gave rise to a counterspin that dominated the following days’ news coverage. In fact, a vigorous debate erupted among many participants about the limits of various tactics, the meaning of nonviolent mass action, democracy, accountability and more. All of this demoralized some, but were necessary steps in the evolution and maturation of the movement. With the state repression of the past days, occupiers will be seeking new ways to creatively advance the larger challenge to the status quo. 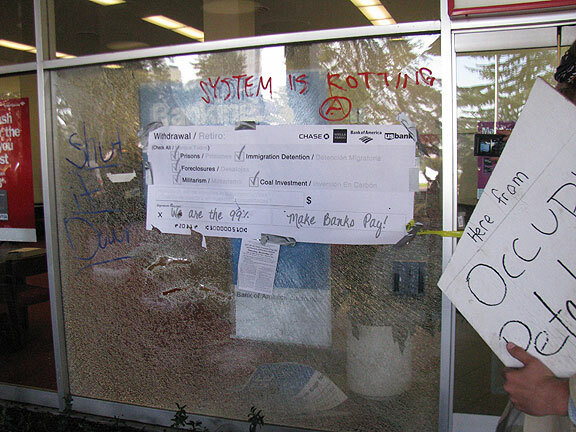 Several banks along the afternoon march got vandalized and windows broken. 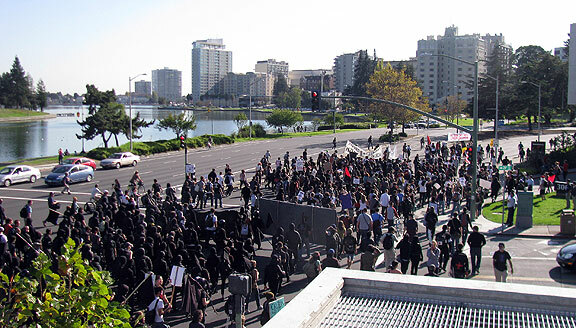 The black bloc during the anti-capitalist march, a while after the attack on Whole Foods and moments before an attack on the Bank of America near Lake Merritt. Postcards from the revolution? The theater of the black bloc is unmistakeable, as is the petty vandalism some of them engage in. One protester was dogging them saying "this is how the Nazi Party started!"... I do wonder how anarchists and left communists can feel comfortable adopting a black uniform, masking their identities, and engaging in macho actions that depend on the safety provided by thousands who have no say about their choices. 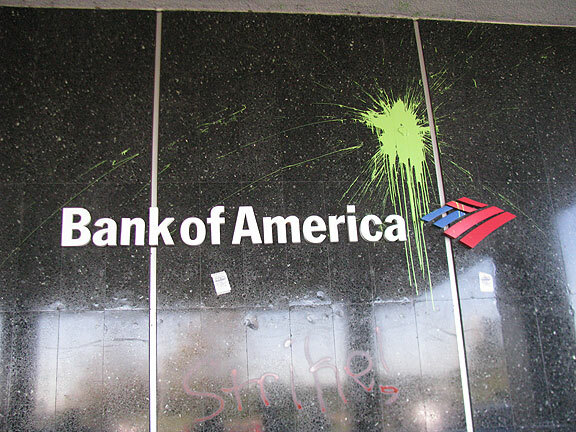 ... a small group of marchers had already broken off to clean paint bombs from the bank walls! How long before this strange political theater is added to promotional advertising for the cleaning products? 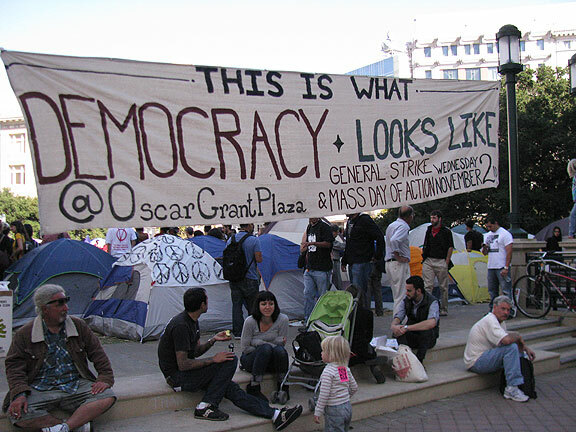 Let’s take a deeper look at the social context that the Occupy movement has emerged from. For the past few decades American politics has shifted steadily rightward. Neoliberalism swept the world and in the U.S. it was anchored in the “Washington consensus” that promoted privatization, reduced government spending, shredded social safety nets, all backed up by police and military. The 9/11 attacks were the pretext for restriction of civil liberties and expansion of police state powers, as well as a decade of wars of aggression in the Middle East and Central Asia. Ten years later the U.S. is still bogged down there and is now murdering its own citizens in Arabian deserts (ostensibly at peace) without trial, conviction, or sentence. Obama was elected by a population ready to restore civility, honesty, and social solidarity but like every politician from our One-Party (two-faction) system, his exercise of power has served the 1% at everyone else’s expense. The siren song of democracy dies hard though. People have streamed into the Occupy camps, often to visit and talk rather than to stay and camp. In the General Assemblies countless people are discovering a nascent direct democracy that slakes their long unquenched thirst for genuine politics. 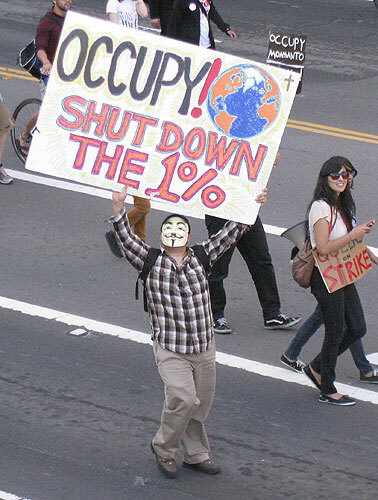 The 99% meme has been enormously helpful in opening a space that invites everyone in. Obviously the actual campers are not 99% of the population. But by holding to that claim, everyone from the unemployed white middle-aged factory worker and the laid-off middle manager, to the unemployed Ph.D.s and newly minted college students, to the millions of foreclosed and laid off, to the permanently unemployed underclass living on the streets of the U.S., have been welcomed into the process. In the Occupy camps people from different economic situations have met face to face again after three decades of stigmatizing and ostracizing the people labeled “homeless.” To be sure, there are many people with severe mental health issues living on the streets, victims of a callous dismantling of social services during the rise of neoliberalism. 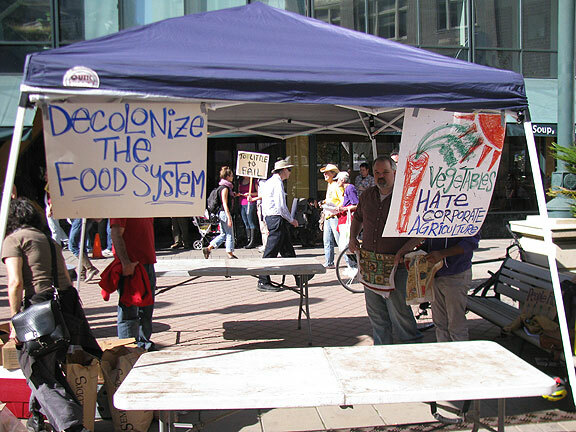 The Occupy camps have been an obvious beacon to people who are hungry, cold, and alone in the harsh life of the streets. The camps have been feeding thousands of people, providing basic medical services, and reconnecting participants to a genuine social solidarity. The daily interactions and shared life of the camps have helped reduce the walls that poverty, race, and class animosities have built. Too many folks living paycheck to paycheck have been able to believe the myth that “I’m not like THEM!” That false bravado has reinforced the moralistic judgment that people living on the streets have somehow brought it on themselves. Now that most of the 99% realize they too are being robbed, and their precious lifestyles are in jeopardy, the fissures cultivated between middle-working class people and the very poor are starting to shrink. The people of North America have watched their wealth diminish while the super-rich have grown immensely richer (often overlooked in this saga is how most of the Global South has been kept in desperate poverty during the looting of their economic resources by the same super-rich). While this shift in wealth has gone unchecked, the work that most of us do to reproduce life has changed too. Manufacturing work has plunged while digital “infolabor” has grown enormously, along with a huge expansion in low-wage jobs at Walmart, McDonalds, and other “service sector” businesses. The rapidly rising cost of health care has also fueled the vast growth of hospitals and drugstores but especially the insurance bureaucracies, with the legions of employees needed to keep it all going. The well-documented deindustrialization of North America has also led to the destruction of many once-thriving neighborhoods and even whole cities like Detroit, and led to the hollowing out of many others, including San Francisco and Los Angeles. In the wake of these jarring economic dislocations, people have been on the move. Not only do we have millions of recent immigrants from Asia and South America, but Americans have been on the move too. This has led to a breakdown in established neighborhoods and communities, and a further fragmentation of daily life at the residential level. Who knows their neighbors anymore? Who knows the people they work with very well? Everyone is constantly changing jobs, changing homes. These changes in work—in how we make our lives—have changed our social conditions too. The most obvious change is how many hours every day many of us spend on the internet, looking for jobs, looking for love, reading emails, following friends on Facebook, uploading and linking images and ideas, etc., trying to stay “connected.” But no matter how long we’re online, we are always falling behind the rush of information, the mounting pile of messages, the articles we’ve bookmarked or downloaded but not returned yet to read. All of this individualized hyperproductivity is at the root of the fragmented, atomized lives we’ve been living. No matter how much we “connect” online, we find ourselves quite isolated at home in front of our computers or TVs. 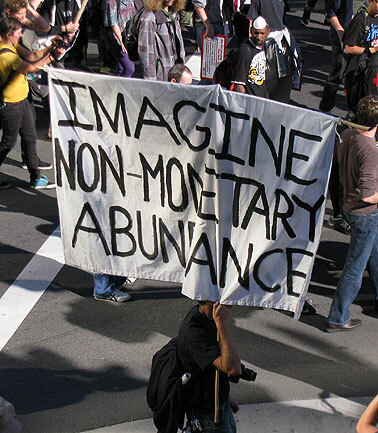 The Occupy movement, by returning life to public spaces, is a passionate rebuke to that isolation. A smart book called “After The Future” by Franco “Bifo” Berardi provides insights into these deeper changes. He connects the increased digitization of work with the rise in anxiety, depression, and suicide in the recent past. Full employment is over. The world does not need so much labor and so much exploitation. A radical reduction of labor time is necessary. Basic income has to be affirmed as a right to life, independent of employment and disjoined from the lending of labor time. Competence, knowledge, and skills have to be separated from the economic context of exchange value and rethought in terms of free social activity. “The word “precariat” generally stands for work that no longer has fixed rules about labor relations, salary, or the length of the work day. However, if we analyze the past, we see that these rules functioned only for a short period at the heart of the twentieth century, under the political pressures of unions and workers, in conditions of (almost) full employment. Thanks to a generally strong regulatory role played by the state in the economy, some limits to the natural violence of capitalist dynamics could be legally established. The legal obligations that in certain periods have protected society from the violence of capital were always founded on political and material relations of force (workers’ violence against the violence of capital). Thanks to political force, it became possible to affirm rights, establish laws, and protect them as personal rights. With the decline in the political force of the workers’ movement, the natural precariousness and brutality of labor relations in capitalism have re-emerged. If we analyze the technical transformations introduced by the digitalization of the productive cycle, we see that the essential point is not that the labor relation has become precarious (which, after all, it has always been), but the dissolution of the person as active productive agent, as labor power. The cyberspace of global production can be described as an immense expanse of depersonalized human time… Capital no longer recruits people but buys packets of time, separated from their interchangeable and occasional bearers… The mobile phone is the tool that makes possible the connection between the needs of semiocapital and the mobilization of the living labor of cyberspace. The ringtone of the mobile phone calls the workers to reconnect their abstract time to the reticular flux. As we go about our daily lives in the U.S., we are bombarded by endless rhetoric about freedom. Politicians constantly brag about how free we are, how this is the greatest country in the world, ad nauseum. We know better. 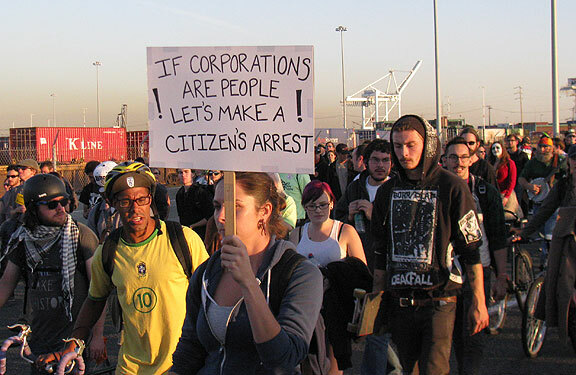 The Occupy movement has brought us into public together to repudiate the lies that dominate this society. Among the biggest lies is the notion that we are free as individuals when we are at work. On top of that illusion, we are also repeatedly admonished that we need a lot of education to be capable of holding the high-skilled jobs of the 21st century. In both cases, these claims are false. We are far from free, and most jobs can be learned in a very short time. Now that we have an insecure relationship to work, too many people bury themselves in endless rounds of skill development, trying to remain desirable for at least the occasional contract job. [The person’s] liberty is a juridical fiction to which nothing in concrete daily life corresponds. If we consider the conditions in which the work of the majority of human, proletariat and cognitariat, is actually carried out in our time, if we examine the conditions of the average wage globally, if we consider the current cancellation of previous labor rights, we can say with no rhetorical exaggeration that we live in a regime of slavery… From the point of view of the valorization of capital, flow is continuous, but from the point of view of the existence and time of cognitive workers, productive activity has the character of recombinant fragmentation in cellular form. Pulsating cells of work are lit and extinguished in the large control room of global production. 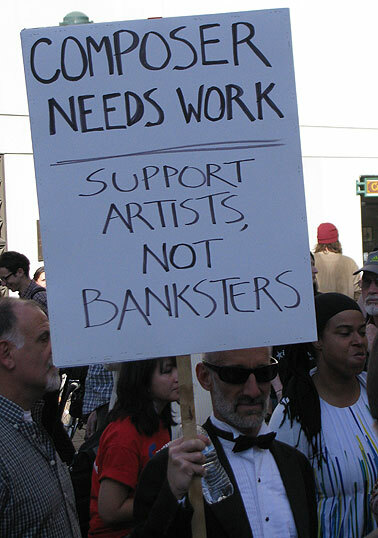 Infolabor is innately precarious, not because of the contingent viciousness of employers but for the simple reason that the allocation of work time can be disconnected from the individual and legal person of the worker, an ocean of valorizing cells convened in a cellular way and recombined by the subjectivity of capital. 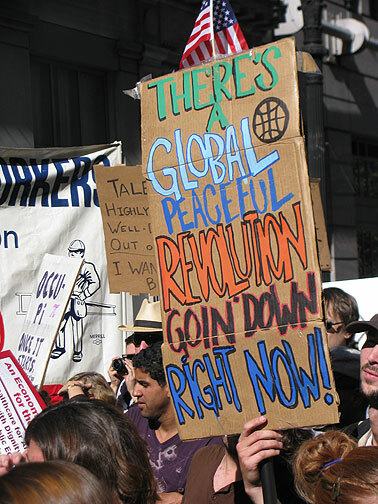 The Occupy movement is a sudden sea change in how we respond to this fragmented world. Instead of accepting our individual predicament, thousands of people have rediscovered public space, and in it a public, shared life. The implications of the Oakland General Strike in this context are huge. Sure, a portion of the working population of one city of less than a half million took a day off during an unusually summer-like November week. 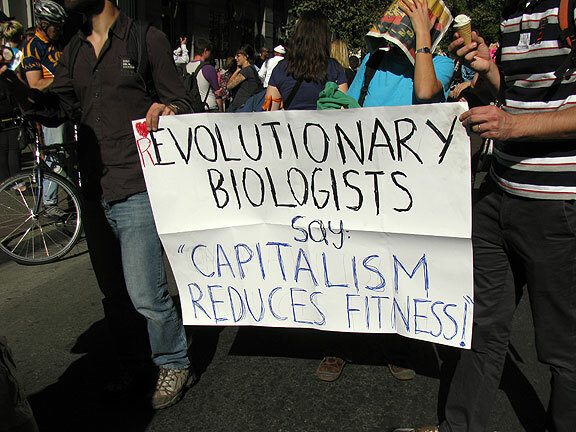 But having stopped our participation in the planetary work machine, even for a day, beckons us to consider what we might do instead, what we might do if we stop working for the 1% not just for a day, but forever. The possibilities that emerge from a collective strike are infinite: the beautiful world we COULD make together is suddenly almost within grasp. 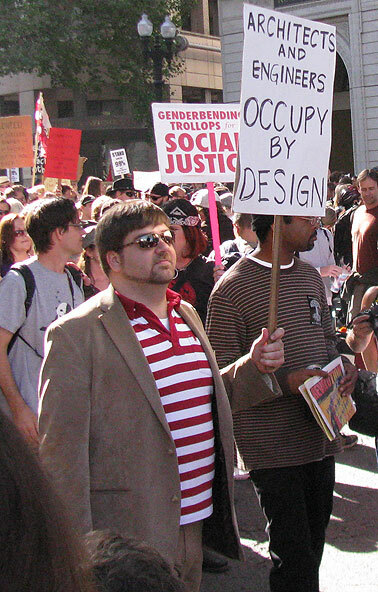 Berardi wrote the chapters in After The Future as separate essays over the years 2000-2009, and he did not imagine something like the Occupy movement being possible any longer. His diagnosis of an epidemic of depression can easily be directed at himself, but he amusingly reminds us that he could be wrong. In fact, he has a number of suggestions for the future of social revolt that dovetail closely with what I’ve written previously, especially the way I described the Critical Mass bike rides as an act of collective “assertive desertion.” (Interesting too to note Portland’s Elly Blue’s essay noting the presence of CM cyclists in many Occupations.) 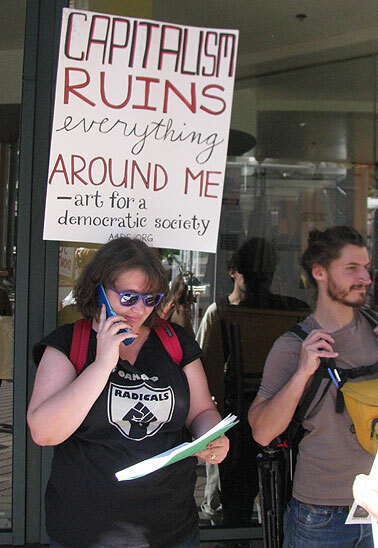 At this important juncture in the Occupy movement, maybe these ideas should be in the mix, especially as the tired polarization between theatrical vandalism and moralistic pacifism has again emerged to try everyone’s patience. The state would like us to be violent. Violence as cooptation tries to make us more like them, and if we’re like them they win twice—once because being unlike them is our goal and again because we’re then easier to imprison, brutalize, marginalize, etc. We have another kind of power, though the term nonviolence only defines what it is not; some call our power people power. It works. It’s powerful. It’s changed and it’s changing the world. But it’s likely that this movement for deep change and deep renewal of society will take longer than a few months. Thousands and millions of people filling the streets, occupying plazas, blocking highways, and stopping their stupid jobs through General Strikes may happen, but it won’t be sudden and overnight. In the meantime, to rebuild the social solidarity that has been so damaged by the last decades’ shattering of communities, we need a strategy that begins to build the new world in the crumbling shell of this one. Only withdrawal, passivity, abandonment of the labor market, of the illusions of full employment and a fair relation between labor and capital, can open a new way. Only self-reliant communities leaving the field of social competition can open a way to a new hope. … In this context, passivity does not mean ethical resignation, but refusal of participation. Capitalism is demanding participation, collaboration, active intervention in the economy, competition and entrepreneurship, critical consumption, constructive critique. All this is fake. Activism is fake, when no horizon can be seen. 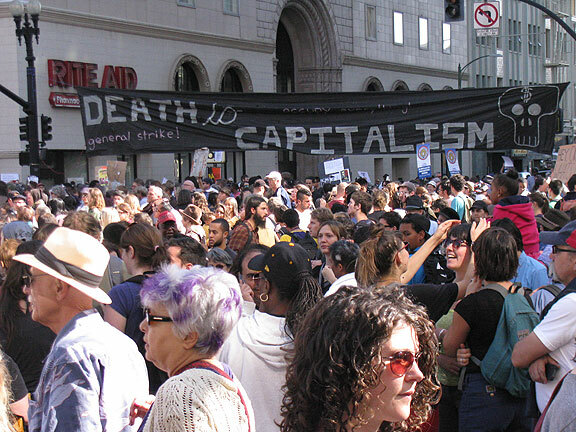 Radical passivity means active withdrawal, and withdrawal means creation of spaces of autonomy where solidarity can be rebuilt, and where self-relying communities can start a process of proliferation, contagion, and eventually, a reversal of the trend. The task of the general intellect is exactly this: fleeing from paranoia, creating zones of human resistance, experimenting with autonomous forms of production using high-tech-low-energy methods—while avoiding confrontation with the criminal class and the conformist population. 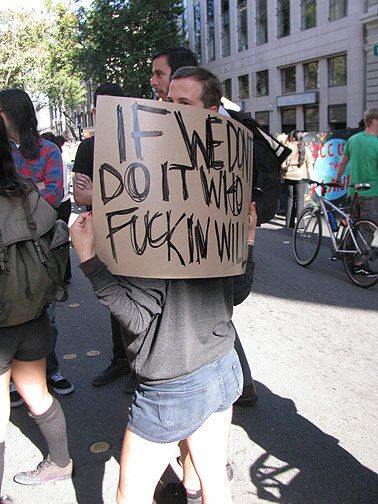 The confrontations have been at the heart of the Occupy movement. No doubt they will continue to be for some time. But if they begin to wane, or even just take a winter break, it’s good to think of the many things we can do that get us ready for the next wave of refusal and reinvention. Here, to conclude, are some last images from the march to the Port of Oakland and its successful closure during the November 2, 2011 General Strike in Oakland. 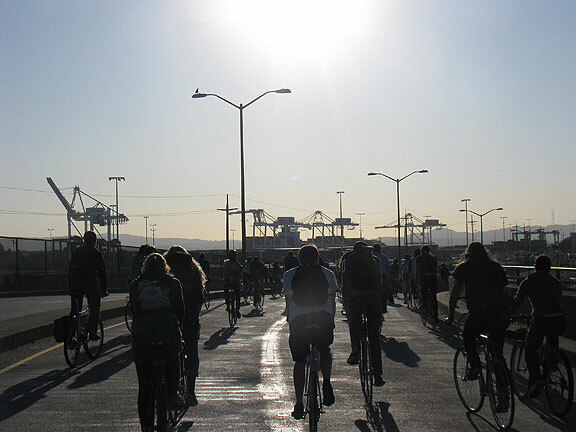 I was with about 80+ bicyclists who rode ahead of the 4 pm march to reach the Port in time to stop the evening shift from arriving to work. 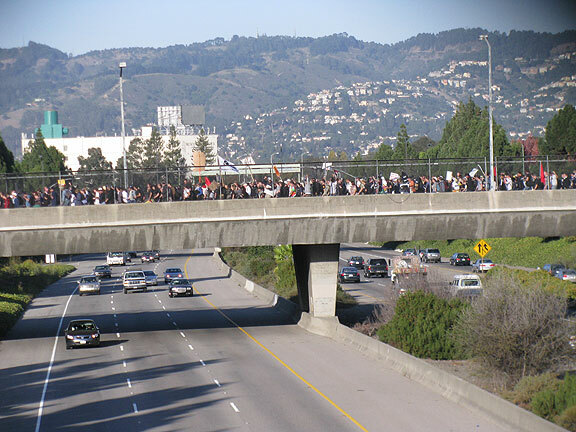 We felt like a cavalry arriving as we approached on this overpass. Other early arrivals and the bicyclists stopped the major port access area. The 4 pm march left downtown across the freeway, heading to the Port. 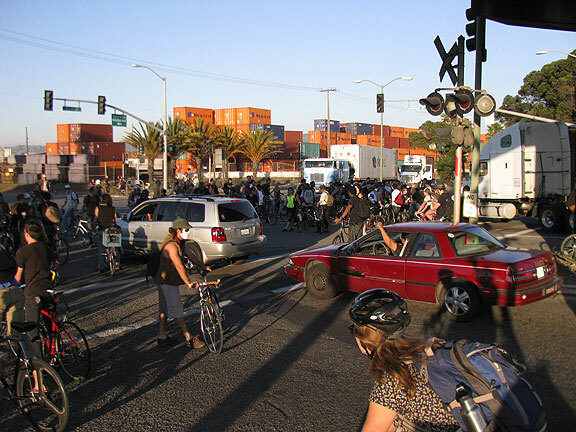 At Maritime and 7th, a cluster of cyclists stopped traffic in all directions for more than an hour, preventing longshore workers from getting to their piers to work (most local workers, including the folks in the blocked cars and trucks here, expressed support for the action). 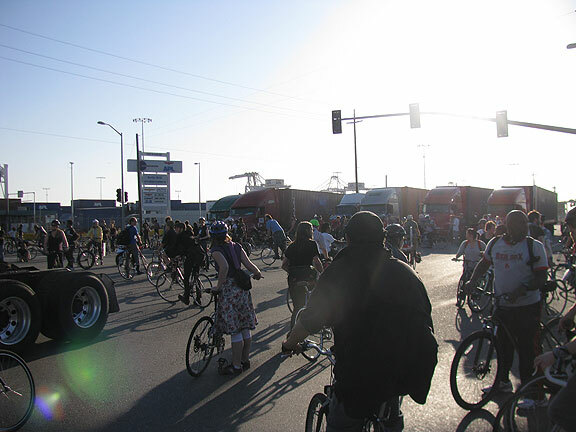 Thousands of marchers filled the Port and shut it down for the evening. 1 comment to The Future Changes its Spots! 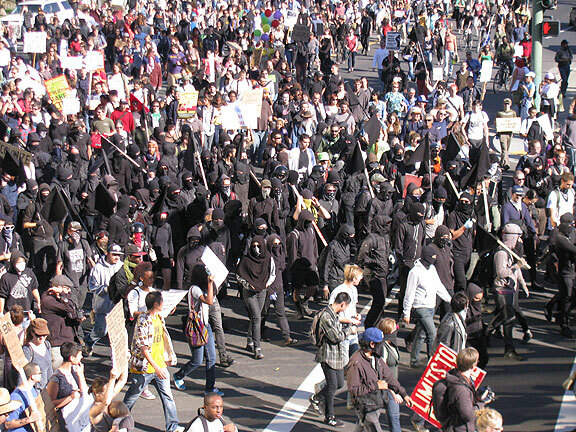 Black Blocs started in Germany with the Antifa movement and the Autonome movement. To compare that to Nazism is sickening.